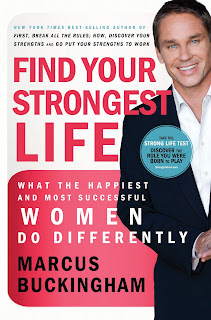 The author of “Now, Discover your Strengths” (among other books) now directs his attention toward women with “Find your Strongest Life,” subtitled: what the happiest and most successful women do differently." Buckingham provides examples of successful and unsuccessful women and then provides a framework of roles (similar to strengths) to help women understand how they can work most successfully. He also offers a section on solutions to questions related to careers, relationships and kids. I have to be honest, friends. I didn’t like it. I have read Buckingham’s previous books on strengths and consider myself a “strengths-person.” I believe in the strengths finder program and the idea that we should be working primarily to improve our strengths (not our weaknesses) and that we should try to operate in our strengths as much as possible. I’ve also heard him speak before and enjoyed it. So I am as surprised as you are about my lack of enthusiasm for this book. Here were my major problems with it: 1. It took too long to get to the solutions – I had to read almost 100 pages before the roles were identified. 2. The examples were unclear and too wordy. I read two chapters with no idea what characteristics I was supposed to be identifying in the main examples. And 3. It is 100% geared toward working women/mothers. I found little value here for the stay-at-home mother, and if I were a stay-at-home mom, I would get a sense that Buckingham would feel I am better used in the work world. That being said – perhaps this book IS written for the working woman/mother. In that case, then it may be more readable and more helpful. I thought the roles that he assigns are interesting and I can see myself in some of them, and I thought that after he explained the roles, the examples were much more clearly articulated and easy to understand. I took the strong life test twice and was disappointed in the test: 23 questions that often had no relationship to my life, but more importantly, the four options for answers generally did not encompass ANY of the responses I would have to those situations. Or I was forced to pick an answer when my real action would have been some combination of two. The first time I took the test, I think the roles assigned to me were the most like me. The second time, I answered 3 questions differently, I think and the roles were completely different and one was totally unlike me. For your money, I would buy one of Buckingham’s book on the strengths instead. So yesterday I told you about my visit with my dear friend Laura. Laura was with me as I celebrated my one-year anniversary of living in LA. But the celebrations and the fun of summer did not end with her visit! A couple days after she left, I was back at the Hollywood Bowl, with some friends from church, enjoying box seats at a production of the Berliotz Reqium - amazing. And then just a couple days after that, two of my aunts arrived for a week-long visit. My dad, as some of you know, has six sisters. Well, the youngest 2 are about 10 years younger than the next oldest. Which means that they are only just over 10 years old than me. Gloria and Donna have often been more like big sisters (especially in my adulthood) than aunts, and we always have a good time when we're together. This is what it was supposed to look like: Yes! I was taking them to "Rydell High" from Grease - which is actually Venice High School (about 4 miles from my apt - meanwhile we drove about 15 miles into East LA before realizing our mistake and driving alllll the way back). A funny start to the beginning of the trip! On Sunday we had our first (of many) days at Disneyland! It was pretty busy and VERY hot, but we had a great time going on all the rides we could get to before we were just too blooming tired. I stayed overnight at their resort and we headed for round 2 the next day. Glo wasn't feeling well, so just Donna and I took in the park on Monday. Mondays and Fridays are great days at the park - hardly busy once school starts, so it was nice to have shorter lines. We finished the day by riding the rafting ride at California Adventure 3x in a row and then heading to the California Screamin' roller coaster for our last ride. After the tour, we had tickets to see a taping of the Ellen Degeneres show. It was a really fun experience! The guests that day were Jennifer Aniston and the Dave Matthews Band!! We saw a short outdoor concert with the DMB and the whole audience recieved "Shake-It Weights" - which are a silly weight lifting system - you can check it out on the ellen website. Later that night, we went back to Westwood for some good Chinese food (Mr. Noodle!) and were able to see Jennifer Aniston and Aaron Eckhart on the red carpet at the premiere of "Love Happens" - that was a fun finish to the night, even though we didn't get to get into the movie. Wednesday and Thursday, Gloria and Donna hung out in Orange County and I spent the two days working. But Thursday afternoon, they came back up to LA and we drove to the Bonnie Hunt show in Culver City. I think this was even better than Ellen! Bonnie is so personable and after the show she actually came up and talked to the audience, shaking their hand and saying "Thanks for coming!" The main guest for the show was Queen Latifah and we all received copies of her new CD!! I was really excited that the week included getting to see Jennifer Aniston, Queen Latifah, Bonnie Hunt, Ellen, AND the Dave Matthews Band in person. What a week! I drove down to Anaheim on Friday and the three of us took Disneyland by storm one last time. It was a really fun day - we did all the rides we really liked one more time. Very fun! Saturday was "beach day" so we met up at Scotty's in Hermosa Beach for a fish - and -chips lunch and then walked on the beach a little bit. Afterward, we drove along beach blvd and ended up hanging out at a beach watching people practice hang gliding. It was a beautiful view, the people were nice, and it was really cool to watch them fly over the dunes. Later we drove into Redondo to see "Love Happens" - then headed home to rest up for our big Sunday plans. Sunday was the last day of the visit, and we had saved our "coolest" thing for last. Gloria and Donna had gotten us tickets to sit on the bleachers at the red carpet for the Emmy awards. We got there after breakfast and were hoping for a cool day, but it was right in the middle of our heat wave - so it was hot as the sun out there! Once we got onto the bleachers, we got gift bags - including a little backpack from People magazine and an Emmy t-shirt! They also provided us with free water and coke. It was a long wait until things started happening, but soon celebrities had filled the red carpet and we could barely keep track of the people going by! Highlights for us: julia louis-dreyfuss, the cast of 30 Rock and the Office, bob newhart, jeff probst, among others. We were totally exhausted by the end, but it was totally worth it! We came back to the apartment, ordered some pizza and watched a little bit of the broadcast before the gals headed back to their hotel to get ready to fly out the next day. It was a terrific visit full of great memories!! More pictures available on facebook, and I'll try to get an album posted here or on Flickr, too. You have been so patient! I am grateful for it. I just looked back and noticed that I hadn't posted about my friend Laura's visit yet, either! Well, since then, the Lord has been so faithful to knit Laura and I together. We became dear friends and have supported each other through a number of joys and sorrows. She came to visit in early September (over labor day), but before that we had not seen each other for three years! We were so excited about this visit - we had been anticipating it for literally months! Laura had never been to California, and never seen the Pacific Ocean, so going to the beach was high on the list, as was a trip to Hollywood and Beverly Hills, some shopping (I needed her to help me buy pants!) and Disneyland. We also anticipated a lot of walks and naps as a part of the trip. The next day, we slept in, then packed lunches and headed to Hermosa Beach (my favorite beach). It was the perfect beach day - it was nice and warm, and the breeze wasn't too cool. We ended up swimming a little bit in the ocean (it was actually not cold, which was wonderful), reading, napping, walking, and talking. After we had gotten our fill of sun (and a little sunburn), we headed into Redondo for mexican food and then a cheap movie. All in all, it was a great day! Saturday, we headed to Hollywood and enjoyed delicious pretzels and a tour of Hollywood and Beverly Hills. Then we went shopping out in the valley (this was a highlight for me - because I really needed Laura's opinion and help!). Sunday, Laura came with me to church and helped with the kiddos. It was really fun to have her there! Afterward, we ate some lunch and toured the UCLA campus. That night we met up with my friend Jessica and a friend of hers, and the four of us went to the Hollywood Bowl. We packed food and ate in our seats before the show began. The show itself was amazing. Each year they do a "Night at the Movies" and this year it was a tribute to Rodgers and Hammerstein - so the symphony orchestra played parts of the scores to R&H movies while they showed the movies on screens throughout the ampitheater. We got to watch the scenes and listen to the vocals from the movie while the score was performed live. It was really incredible!! What a great night! On Monday we headed to Disneyland, which was another fun day. We rode some rides, tried to stay out of the heat, and I loved seeing Laura experience it all. It was Laura's first time, and we are excited to go back again someday with Andy and their kids as well! Laura left on Tuesday, bringing our great reunion to an end. We had a great time and can't wait to get together again!